Twinwall pipes are manufactured from a twin extrusion process where two HDPE pipes are extruded and heat welded simultaneously, one inside the other, to create a corrugated pipe with a smooth inner wall which assists hydraulic flow. Available as unperforated (also known as carrier drain) and perforated (filter drain) twinwall pipe weighs less than 6% of the equivalent size of concrete pipe, and so has grown in popularity for collecting and carrying surface and storm water in a drainage system. 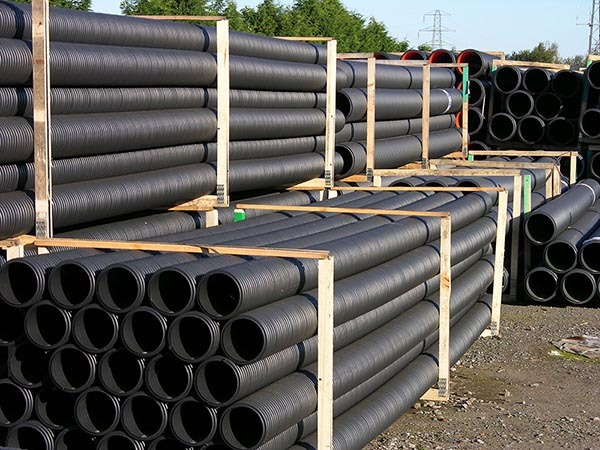 JDP offer one of the largest ranges of twinwall drainage systems in the UK. As well as BBA approved twinwall pipe and fittings JDP provide alternatives for projects, such as agriculture or field drainage, which don't require stringent approvals. JDP's Fabrication Team specialise in manufacturing fittings in-house which can offer large cost savings to these projects. Order couplings separately. If creating a sealed system sealing rings are required. For larger sizes, please see JDP's Large Diameter HDPE section. Half perforated also available upon request. Twinwall unslotted carrier pipes and slotted filter pipes and couplings must be installed in accordance with highway authority requirements and clauses 503, 505 and 518 of the manual of contract documents for highway works. For typical laying, trench and backfilling specification details reference should be made to the manual of contract documents for highway works, volume 3 drawing No F1, Types T and S and F2, Types G, H and I. Pipes are cut easily using conventional hand tools, and should be cut square between the corrugations. For a watertight joint, the pipe ends and coupler should be cleaned and the rubber seal fitted externally between the first and second corrugation in the pipe. The inside of the coupler should be lubricated and the pipe pushed fully home to the central register either by hand, or using a lever if necessary. Twinwall slotted & unslotted pipes and couplings must be protected against damage from site construction traffic. Care should be taken during backfill to maintain the line and level of the pipeline. If necessary, the pipe should be restrained to prevent uplift.